Y’all seen this yet? Check it out cause it had me laughing hard. 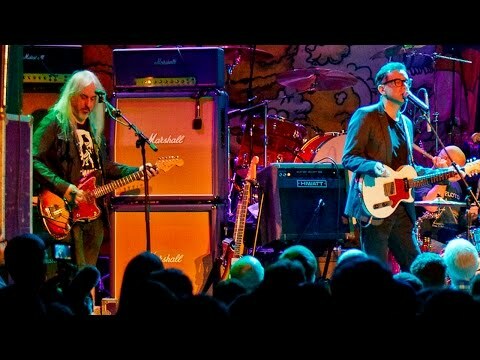 Shout out to J Mascis in the crowd. Oh man his takes on music genres. Killed me. This is ghost me. Fred murdered me with funny. Yes! Finally someone else who saw this. I almost passed out when he did his take on jazz. Not until now. Thank you. Fred is such a strange interesting guy. That bit about the decomposing fox was good and it’s true I am from Southern California and we do pronounce every syllable in California. Haha. The trailer for this didn't make me want to watch it. "Here's my impression of this, here's my impression of that" seems like pretty dated comedy. I'm with Jim on this. I saw the trailer and was like, "meh". I feel like Fred's comedy isn't for everyone. I personally am not a fan, but just like all art, it's subjective. ^it’s all good. Just giving the heads up for those that might enjoy it. I just watched this and really enjoyed it. Highlights for me were his rundown of American accents, and playing the drum kits from each decade. the one instrument i can hang with and play is drums so a lot of his points i totally got n cracked up on! and oh! friggin Sheila E making a cameo and looking absolutely amazing at 60! that right there is the Glamorous Life! so much respect for her on so many levels! His dislike of Jazz, Zydeco and the Blues is not exactly a Portland friendly look for him.... Did he throw Rap in there as well, haven't watched all of it. The part about "It's dark. It's got a dark tone" killed me. That's so true, with drummers talking about their ride cymbal, and guitarists with their amp. "I like silvertones cause they're dark"
I almost got to see a show at Great American Music Hall but we bailed because a certain mamma at the time with zero tolerance due to pregnancy and nursing got taken down by Pliny the Elder before the show! lmao poor girl. We were supposed to go see Islands, Nick Thorburn's from The Unicorns new band. hahah @cdrive - i JUST had a Pliny on monday! Yeah the skit on being the only guy in the blues crowd hit home for me too. (A) Because I'm just not that into blues anymore from back when I was first learning guitar as a teenager, so it really is like that - "Oh yeah that's cool" to an almost immediate drop off of wanting to listen haha. and (B) I've totally been in that uncomfortable spot where you want to leave but you don't want the band to see you leave. So my out is always to take that final big swig of beer and then kinda look at the glass while giving it a little shake and then act like your heading to the bar for another. Man, Fred wasn't kidding when he called this "Stand-up for Drummers". Almost 2/3's of this routine are related to drums, and almost all of it is related to music. Like Portlandia, this was pretty hit or miss for me. I'd say more good than bad, though. It was cool to see actual drum kits from different time periods. I wish Fred would have let his guests shred at the end, instead of playing some basic 4/4 rock beat.